Soft and chewy gingerbread cookies with a sparkling sugar coating. A fun and flavorful treat to enjoy during the holiday season! In a large bowl or stand mixer, cream together butter and sugars until light and fluffy. Mix in egg and vanilla, scraping the bowl as needed. Mix in molasses, followed by spices, salt and baking powder. Add flour one cup at a time until fully combined and no streaks remain. Chill dough for 15-30 minutes or until firm but manageable. Dough may also be chilled overnight or for up to 2 weeks and frozen for up to a year. If chilling dough longer than 30 minutes, allow dough to sit at room temperature until just scoopable but not soft. Preheat oven to 350°F. Prepare a baking sheet with a silicone baking mat or parchment paper. Add sanding sugar to a small bowl. 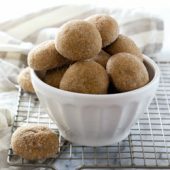 Using a medium cookie scoop, scoop and shape dough into 1 1/2-inch balls. Roll in sanding sugar. Space dough 1-2 inches apart on prepared baking sheet. Repeat with remaining dough. Bake for 15 minutes. Allow cookies to sit for 1-2 minutes before transferring to a wire rack to cool completely.